Akamai (s AKAM) could soon begin leveraging peer-to-peer (P2P) technology to enable its media customers to stream live or on-demand videos to end users. While Akamai has been experimenting off and on with P2P ever since its acquisition of Red Swoosh way back in 2007, the introduction of video streaming through its NetSession client-side technology might finally be close to release. 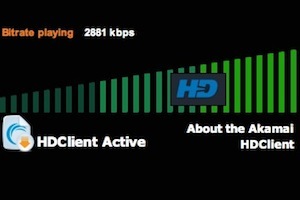 Last fall, Akamai won a deal with the NFL for the delivery of HD video streams on the sports league’s website, which included the use of its Netsession plugin. But Akamai said the plugin wasn’t being used for in the typical peer-to-peer fashion, but to send information back to its servers and ensure that the end user was receiving the highest quality stream possible. Akamai also rolled out a version of its client-side software for game publishers in March to improve the delivery of large game downloads. That client is being used by massively multiplayer online game publishers Aeria Games and Burda:ic. But downloading static files via P2P is relatively easy, and something that software providers have used for years. The technology that’s required to capture bits from multiple seeds and put them in the correct order for streaming video is somewhat more complex. The benefits of P2P-based delivery are huge, as client-side technology drastically reduce the number of bits that a CDN has to deliver. More importantly, if implemented in the right way P2P technology can source bits from viewers closer to the end user, which takes much of strain off the global Internet architecture. P2P advocates have claimed for years that the only way the Internet will be able keep up with traffic demands is if video files can be streamed and sourced through local ISP networks. For years, tech companies have been trying to crack the code for live and on-demand streaming via P2P — and while some, like Octoshape, have been fairly successful with limited implementations of the technology, it’s yet to receive mass consumer adoption. Perhaps the biggest reason is the need for a software client or plugin to make the technology work. With the exception of Adobe’s Flash, which today is nearly ubiquitous, every streaming solution that has relied on new client software has struggled to gain massive scale, if only due to the need to install a client on the end user’s computer. Think Move Networks or Microsoft Silverlight. (s MSFT) While not P2P-based solutions, the software install kept both plugins from reaching the same mass adoption that Flash appreciates. When it goes live, Akamai will face this issue as well. In fact, it’s already received a bit of backlash from gamers who don’t understand what benefit the client provides while running silently in the background. A quick Google search for Akamai NetSession Interface shows user fears of viruses and malware, as well as the assumption that the P2P client will slow down their computers or Internet connections. Akamai isn’t the only technology company that is trying to improve video streaming with P2P technology. Earlier this year, BitTorrent announced a live streaming solution based on a new P2P technology developed by founder Bram Cohen. And Adobe is making P2P-based streaming available as part of an update to its Flash Media Server. Kontiki, Ignite, and Giraffic have had P2P video for some time, but nobody has completely cracked the code yet for monetizing P2P networks, whether it be by using the P2P agents as a smart agent to manage formats or as a dumb agent that simply caches and distributes traffic locally.